Li Guoying, governor of Anhui province, met with Barry Lewis, leader of British Derbyshire County Council, in Hefei on April 23, 2018.Senior officials-Yu Aihua , Li Heping and secretary general of Anhui provincial government Bai Jinming- attended the meeting.The sister province-county relations between Anhui and Derbyshire was established on November 9, 2017.Barry Lewis’s visit this time was to witness the signing of a cooperation agreement between Anhui Xinhua Distribution Group and U.K. Repton International School. 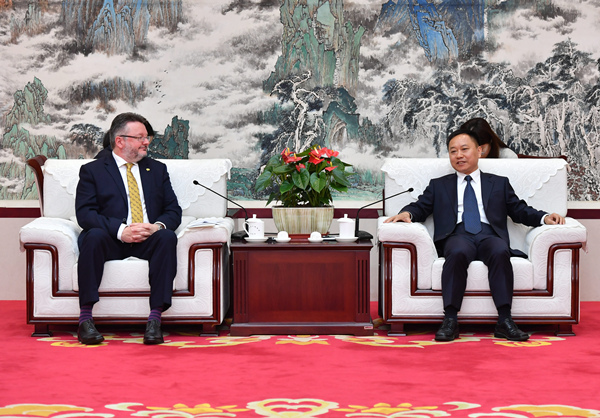 During the meeting , Li Guoying thanked Barry Lewis for his positive efforts to promote bilateral friendly cooperation.Ever since they established friendship in November 2017, the two sides have been on a fast track for cooperation in trade, education, culture and sports, Li said.The educational and cultural program to be carried out in Hefei would play an important part in opening the province wider and attracting talents from abroad.Li expected Anhui and Derbyshire to expand cooperative areas and make the cooperation more productive. Speaking at the meeting, Barry Lewis hoped that the two sides would increase visits and contacts, create new ways of cooperation and build higher-level partnership. On April 22, Anhui Xinhua Distribution Group held a signing ceremony with Repton International School in Hefei . 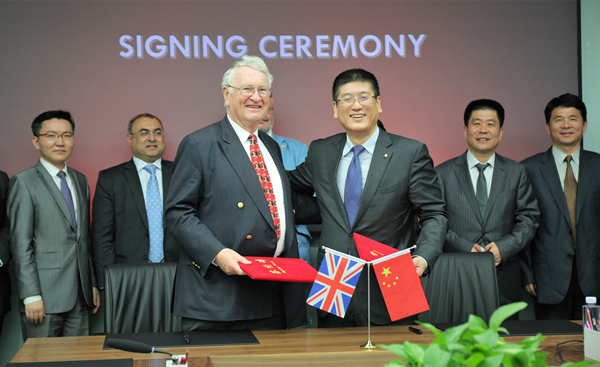 Cao Jie, chairman of the group and Robert Owen, chairman of Repton International School, signed a cooperation agreement on behalf of both sides. Barry Lewis, leader of British Derbyshire County Council,Charles Liang ,East China education director of British International Trade Department, Tony Puri, general manager of Repton International School,Wu Wensheng, the Group general manager , Guo Hongbin, deputy general manager of the group, and Cui Baoping, director of the friendly city department of Anhui Foreign Affairs Office,witnessed the signing ceremony. On April 22, Cao Jie, chairman of the group and Robert Owen, chairman of U.K. Repton International School, sign a cooperation agreement on behalf of both sides. On behalf of the group,Cao Jie, extended a warm welcome to Barry Lewis and the delegation.He said that after more than three years of hard work, the project has finally yielded fruit and contributed to the profound friendship between the two sides. The program’s landing in Hefei is not only an acknowledgement of Anhui Xinhua Distribution Group, but also the recognition of the economic development level, educational level and openness of Anhui. We will strive to make the project one of the best international schools in China. Barry Lewis expressed his happiness to be able to participate and witness the signing ceremony.He said ,the program is a good embodiment of the deepening cooperation in culture and education between Anhui and Derbyshire as illustrated in the sister province-county relations agreement. At the same time ,it also tightens the ties between the two regions. Cui Baoping compared the sister province-county relations to marriage relations and said that the program signed today is our" first baby" .She expressed her wishes for" the baby" to be healthy,intelligent and beautiful. Robert Owen said that it is a very important day for Repton International School and the program in Hefei is the first Repton International School in China.He hoped that it will be the best international school.He is looking forward to turning this idea into reality as soon as possible with both sides sharing common concept in the education business. 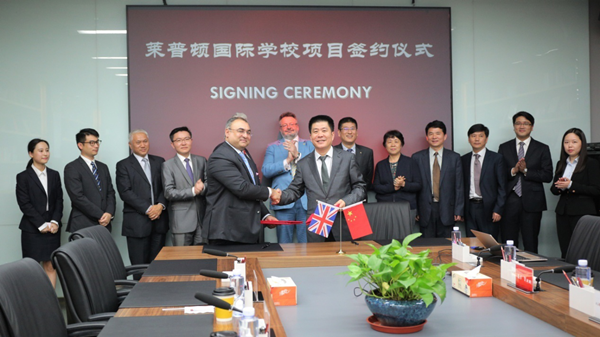 On April 22,Wu Wensheng, the Group general manager and Tony Puri, general manager of Repton International School sign their names as witnesses respectively on the cooperation agreement . During their stay in Hefei,Barry Lewis and the delegation visited shared bookstore ,the group office building,Anhui Books Museum and the group’s Binhu projects. Repton International School , founded in 1557 , is located in a small town in Derbyshire,with a campus area of 80 hectares.Since the middle of the 19th century ,the school has been the leading boarding school in the UK, and maintained a high admission rate into higher grade , reaching up to 95% in recent years, and many students have been enrolled by Oxford, Cambridge and other well-known universities. After signing the agreement,the two sides will jointly establish the best international school in China and build an education service platform with international influence to provide high-quality and variety of education and academic resources for school-age children.Meanwhile,the program will help the group utilize high-quality education resources overseas to achieve two-way growth of revenue and brand influence and further integrate high-quality education resources to create education ecological industry chain.